I want to encourage everyone to support Raleigh’s tornado victims and support ComeUnityNow. ComeUnityNow happened Saturday, July 30, 2011 from 10 am to 10 pm and was a huge success. Here one picture I took from my iPhone of my friend Dan painting. Also go to the Facebook page to see some of the great photography from the day by Dianne McKinney. This is a grassroots event, replacing “Raleigh Wide Open,” and is filled with artists, musicians and family fun. My good, friend Dan Nelson, one of the organizers, will be there painting and maybe even playing some music. My small contribution was the typography, and ideas, for the logo that he illustrated (seen above). I hope to see you there (I’m waiting for the sun to go down to beat the heat. If you can’t come, then at least contribute to the tornado relief fund here). This is the new event that is Replacing Raleigh Downtown Live. There will be music, artist, performers, dancers, auctions and more. Right now, people are gathering together to help the victims of the tornadoes that touched down in April and destroyed so many peoples lives. 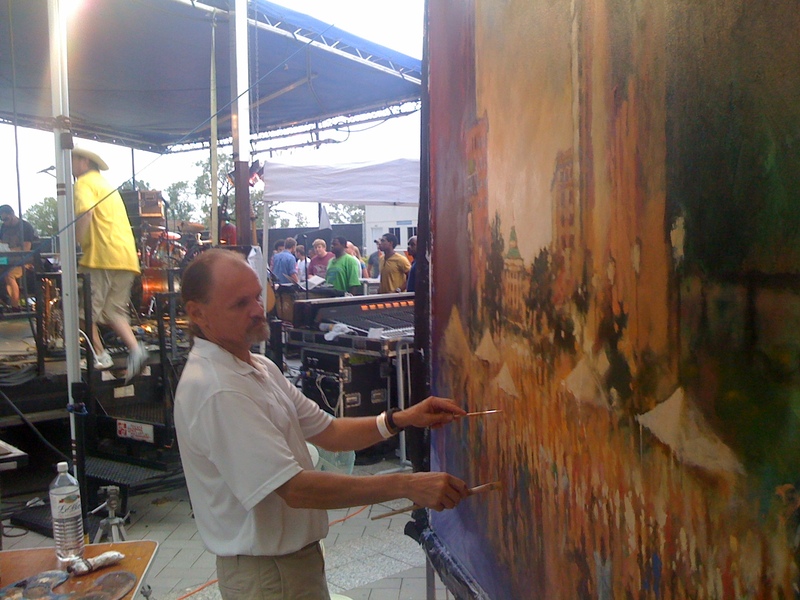 The arts festival is free, and open to everybody. The music festival is $10 per person. They are also looking for volunteers, and performers too. So if you have a talent, craft, or anything you want to show off, then sign up. We are a gathering of non-profits, individuals, corporations and communities of faith coming together to celebrate the uniqueness of our city, identifying how we can grow by serving each other when a disaster strikes and to encourage this spirit to remain in place. We are organizing and hosting an event to recognize those individuals and groups who have been instrumental in providing assistance to recent tornado victims, as well as making donations to two local organizations (Wake Interfaith Disaster and The Green Chair Project) who will provide assistance in moving those impacted from short-term relief to long-term recovery. Saturday, July 30 2011 10am-10pm. The Heart of Raleigh, the City Plaza on Fayetteville Street. A tornado relief fund-raiser called ComeUnity Now is under way in downtown Raleigh. The festival is divided into two events, a music festival costing $10 per person and a free arts festival on Fayetteville Street and City Plaza. Bailey said the group’s goal is to raise $100,000 for victims, which will help them purchase furniture, buy building supplies and for other needs not covered by insurance.